When it comes to charity, many Americans have been able to “give ‘til it hurts” — knowing the pain would be only temporary. They could write off the donations on their next tax return. However, changes ushered in by the 2017 Tax Cuts and Jobs Act could make the process less comfortable. While the tax plan will make filing simpler for many taxpayers, those accustomed to deducting their charitable donations may have to make some adjustments. Here’s what you need to know about maximizing your donations in the new federal income tax landscape, as well as finding other ways to contribute. Under the right circumstances, itemizing your deductions can provide a tax benefit by lowering your taxable income. The key is whether certain deductible expenses exceed the standard deduction. Choosing to itemize individual deductions rather than claiming the standard deduction. Claiming your allowable expenses, which include mortgage interest, state and local sales taxes, property taxes, and, of course, charitable donations. If your itemized deductions add up to more than the standard deduction, your taxable income goes down that much more. It may not be a financial windfall, but a lower taxable income can lead to a lower overall tax bill. In the case of charitable donations, itemizing also provides a financial incentive for supporting worthy causes. However, critics of the reformed tax code say its new deduction standards reduce the benefits, and therefore the incentive to give. Although the basic procedure remains unchanged, the various thresholds for itemized deductions have nearly doubled. As a result, taxpayers have a much higher bar to clear for itemizing to make financial sense. The Tax Cuts and Jobs Act also raises limits on cash donations as a percentage of adjusted gross income. In addition, it eliminates limits on itemized deductions for upper-income taxpayers. However, according to the Council, the negative effects of the increased standard deduction would limit the benefits of the other changes. Charitable donors have a few options for adjusting to the changes in the tax code. Consider the following strategies, but always consult with your accountant or financial adviser before making a decision. “If a taxpayer chooses to do this, we recommend connecting with someone on the development staff for the nonprofit so they know why that person might have irregular giving habits — and so the nonprofit can keep connected with that donor in those ‘off’ years in some way,” said Cohen. A donor-advised fund (DAF) offers an alternative to bunching or bundling. Public charities establish DAFs on behalf of donors, who get a tax benefit plus the ability to direct their donations toward different charities over time. When you contribute to a DAF, you can take a one-time tax deduction against the full amount. In addition to cash, the assets that you can contribute to a DAF include real estate, stocks, bonds, mutual fund shares, and other publicly traded securities. Donor-advised funds do carry some potential drawbacks. Donors may have to pay administrative fees, for example, and some DAF providers require a large contribution to open one. Amounts vary, but a number of providers list minimum contributions ranging from $5,000 to $25,000. If the revamped tax rules make it financially impractical for you to contribute at your current level, you always have the option of substituting manpower for money. Some charity advocates pose the interesting question of whether contributions of time, effort, and expertise can have comparable value to financial donations. Possible examples include an IT specialist volunteering to help a charity set up its office network, or a former college athlete volunteering to coach a youth sports team. What is time worth to a charity? 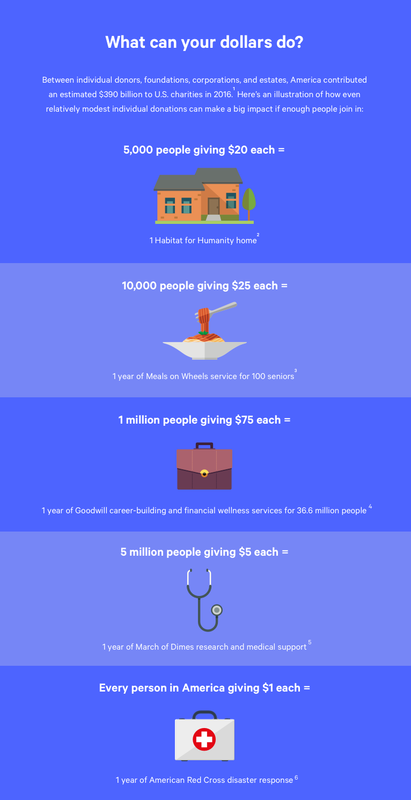 According to the Corporation for National & Community Service, 62.6 million American adults volunteered almost 7.8 billion hours for charitable organizations in 2015. Those volunteer hours translated to an estimated cash value of $184 billion. Although you can’t claim it as a tax deduction, you may be able to support charitable causes by donating unused credit card rewards and loyalty program points. Check your rewards credit card issuer’s policy on rewards donations. It may not earn you a tax break, but you’ll still enjoy the satisfaction of supporting your favorite causes. Even if you don’t have the financial resources for complex tax strategies, you can still provide everyday support for your charity of choice. A number of banks, credit unions, and other financial institutions offer checking and savings accounts that support charitable giving. Some of these accounts may donate a portion of earned interest to a charity chosen by the account holder. Others may provide a one-time donation whenever someone opens an account. In any case, charity advocates urge supporters to continue helping now and in the future. Government policies can and do change, but the need for charitable support remains constant. “Continue supporting the causes you care about, because the need for their services is not going away — and likely forthcoming budget cuts may further strain nonprofits’ ability to serve their communities,” said Cohen. previous post5 Important Things to Do for a Visually Impaired Senior next postCan Aging Seniors Drive Without Paying For It? Guest bloggers are invited to share relevant articles with our members. SeniorNews.com does not endorse the content in any way. To inquire about being a contributor to SeniorNews.com and Senior.com, please click here.